The Food and Drug Administration issued a press release last Friday, warning consumers in North Carolina and other states of the potential harm posed by a B-50 vitamin sold as a dietary supplement. Two potentially harmful steroids were found inside the vitamin, methasterone and dimethazine. The agency received 29 reports of adverse incidents including fatigue, muscle pain, and abnormal laboratory findings for cholesterol and liver and thyroid function. The manufacturing company has refused to recall the product or issue warnings that inform consumers of the danger. This is in the face of evidence that anabolic steroid-containing products can cause acute liver injury or other long-term effects on blood-lipid levels, increased risk of heart attack and stroke, breast enlargement, infertility in men, and short stature in children. Companies may be held accountable when they sell products that are either defective or should be labeled with a warning of potential dangers. In North Carolina a consumer may hold others accountable if 1) a duty was owed, 2) that duty was breached, 3) an injury resulted from that breach of duty, and 4) damages, or costs, occurred because of the injury. In order to be made whole, a consumer may file a personal injury civil suit against a manufacturer if a product caused injury. North Carolina shields manufacturers and sellers from liability if the consumer’s action was contrary to warnings and instructions that came with the product, if the user knew or found a defect or dangerous condition and kept using it anyway, and if the consumer failed to use reasonable care under the circumstances. North Carolina’s statute, GS 99B-5 mandates that an action brought by a consumer shows that the manufacturer or seller of a product failed to provide a warning or instruction for a danger, that the injured must show that the manufacturer knew or should have known that the danger existed, and that the company failed to take the necessary steps to warn or correct the danger. Prescription drug companies are specifically excluded from the requirement to provide a warning if an adequate warning or instruction was already provided by a physician or other person allowed to prescribe drugs. Manufacturers of dietary supplements are not required to sustain the same amount of testing and regulation as prescription drugs. However, dietary supplements are often advertised to be beneficial and used by consumers as health products. Any product placed on the market that causes harm, whether through inadequate warnings or shoddy design, is one product too many. The North Carolina personal injury attorneys, Herbert and Arlene Auger, are seasoned litigators who will fight for the compensation you deserve. The attorneys at Auger & Auger know how medical expenses can add up while the injured client is unable to work, and they work tirelessly to pursue every avenue of legal relief. If you have been injured and would like to speak to one of our experienced attorneys, contact our office today at 888-487-0835. A woman from Person County was killed last week after her car crossed the center line into oncoming traffic. She collided with a truck carrying a teenage driver and three passengers who were taken to the hospital for non-life threatening injuries. Authorities closed the North Carolina road for several hours to investigate, but the cause of the crash remained unknown at the time of the reporting. Head on collisions, like the one described above are terrifying and can cause substantial injuries to those affected, especially at high speeds. The Centers for Disease Control and Prevention estimate that 17.3% of traumatic brain injuries occur as the result of motor vehicle crashes and traffic-related incidents. Motor vehicle crashes that cause traumatic brain injury (TBI) also have the highest percentage of deaths that occur as a result of traumatic brain injury, making up 31.8% of TBI deaths. The medical costs associated with severe injuries like TBI can add up very quickly. The need to cover all related costs like co-pays, lost wages, and traveling to and from doctor appointments can become overwhelming. Car insurance companies do not always pay what they should under the plan you obtained, and certainly not usually what is needed. In North Carolina you can file a claim with the other motorist’s insurance company or sue the driver in a personal injury action. All motorists are required to drive safely and follow the laws of the state when operating a vehicle. If it can be shown that someone failed in their duty to drive safely, the motorist at fault can be liable for damages, or costs, if their negligence led to the injury-causing accident. If a claim is filed with the at-fault motorist’s insurance company, but the policy does not cover the amount of damages, the injured may then turn to their own car insurance policy to cover the remainder. This is Underinsured Motorist coverage, or UIM. For UIM coverage to apply, the amount of damage must be shown to exceed the other motorist’s policy limits and that the injured’s policy limit exceeds the at-fault party’s coverage limits. Uninsured Motorist (UM) coverage applies when the at-fault driver has no insurance at all, and covers bodily injury and property damage. Both types of coverage apply when the accident is a hit and run or the injured was a pedestrian hit by a car. 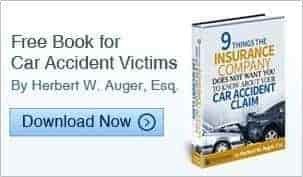 The experienced North Carolina head-on car accident attorneys at Auger & Auger know how to aggressively negotiate and litigate head-on collisions and hit-and-run accidents. They know that insurance companies are reluctant to pay what they should to the injured. Herbert and Arlene Auger have several years of personal injury experience and know the importance of getting the compensation you deserve. If you have been injured and would like to speak to one of our attorneys, call today for a free, confidential consultation at (888) 487-0835. The North Carolina Court of Appeals agreed with the Industrial Commission’s ruling awarding a maintenance man temporary total disability, medical expenses, costs, and attorney’s fees. The injured was hired by a man who originally worked occasionally for the defendants, a couple who owned a farm open for events, dining, and lodging. The hiring employee performed seasonal work at $400.00 a month and had an agreement to stay in a trailer on the defendants’ property rent free. This employee then hired the injured party to assist with carpentry work at $10.00 an hour. This arrangement was agreed upon by the owners. The injured did a lot of work on the property and also stayed in the trailer on the grounds. The defendant-owners decided to move the employees in the trailer elsewhere, so a decision was made to build an apartment in the barn. The injured was working on the interior of the apartment, using spray paint to mark locations for the framing of the apartment. The spray paint, hot because the injured set it on a heater, caught on fire after the injured sprayed while smoking a cigarette. The can exploded and caused the injured to suffer from 3rd degree burns over a quarter of the injured employee’s body. The defendant-owners argued that the injured party was not an employee. The court looked first at whether the man who hired him was an employee himself and then whether the injured was also an employee. If the man who hired the injured was considered to be an independent contractor, then the injured could not be an employee of the owners. Since the man who hired the injured was paid a monthly salary and given free housing, the court determined that he was an employee and not an independent contractor. Likewise, the injured had a similar arrangement, was provided special tools to complete tasks, and submitted calculation of time to the owners, so he was also considered to be an employee. The defendant owner also tried to claim that the injury did not occur while the injured employee was performing work duties. The court focused on the fact that the apartment was being built for workers who stayed on the property because the owners decided to move other employees into the trailer. The court found that the apartment was built in the course of his employment since the accident occurred on the defendants’ property, while he was completing a task they agreed to pay for. Since the injured was found to be an employee performing a work-related task, the Industrial Commission’s decision to grant him total temporary disability was allowed to stand. If you have been injured on the job, the experienced North Carolina workers’ compensation attorneys at Auger & Auger are here to help you recover every single dollar you deserve. Herbert and Arlene Auger know how difficult life can be if payments are not awarded as they should be by employers and insurance companies. If you would like to speak to one of our attorneys in a free, confidential consultation, then call our office at (888) 487-0835. A fatal North Carolina construction site accident on I-485 has raised safety concerns regarding the location of concrete barriers and construction off-ramps. A dump truck driver hit a crash barrier located right in front of a temporary construction off-ramp. The truck flipped and caught on fire, killing the driver. It is unknown whether the driver was confused by the temporary off-ramp, which was set up by a contractor. The North Carolina Department of Transportation has assessed and announced that no additional signs or warnings like removable signs or additional cones were needed. A representative of N.C.D.O.T. stated that a sign for reduced speed was already in use and a solid yellow line drawn, which is supposed to show that drivers are not to cross. Construction site traffic safety is guided by Occupational Safety and Health Administration (OSHA). OSHA requires a traffic safety plan that charts how the movement of traffic will be controlled so motorists know what routes are for motorists and where the construction site is located. This is a greatly important task because 20% of the nation’s highway system is under construction with over 3,000 work sites. Since work zone crashes cause over 40,000 injuries each year, it is important to know who controls what aspect of the construction site so that the proper entity can assume responsibility for the safety of others. The governmental authority in charge is the entity that determines the configuration of the temporary traffic control zone. The traffic control zone for motorists and pedestrians is determined by the construction project manager. The project manager can use signs, traffic barriers, and flags to communicate alternate routes to motorists and pedestrians so that safe passage can be ensured. Accountability may be trickier to obtain when dealing with a government construction site. Interstate, state, and municipal highway construction are all performed by government entities. When government entities are sued, they rely upon the legal doctrine of “sovereign immunity” or “governmental immunity” to shield them from liability. This legal theory is based on the idea that the controlling authorities cannot and should not be sued. Sovereign immunity protects state government and its agencies. Governmental immunity protects local municipalities, but to a lesser extent. Sovereign and governmental immunity can be waived though, through statute or through contract. The North Carolina Tort Act explains that the state of North Carolina can be held liable for negligence on the part of an officer, employee, or agent of the State acting within the scope of authority. The North Carolina car accident attorneys at Auger & Auger understand the intricacies of sovereign and governmental immunity, and they will fight to get the compensation you deserve for a construction site car accident. If you have been injured in a construction site car accident and would like to speak to one of our experienced personal injury attorneys, contact Herbert or Arlene Auger today at (888) 487- 0835 for a free, confidential consultation.